32 ct. French Vanilla by R&R, Various over-dyed silks (1 over 2). Ok, this slump of yours is killing me!! So pretty - SB colors are always so soft and pretty! Oh gosh, it's pretty! I need to finish mine! Yes, the SB colours are so soft - they are instantly recognised. I will have to get out another one to start. Very pretty, Nicole! I love the colors! Your Sail Away is absolutely gorgeous! Lovely soft colours. 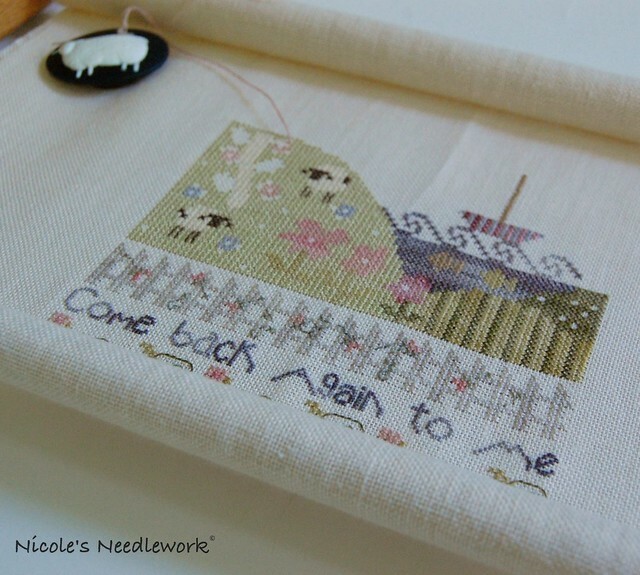 I'm wondering, if and when you've finished stitching this, will you be willing to sell the chart to me? Thanx! Oh my, it is so sweet! Lovely sampler! Sail Away is so pretty, Nicole. It looks you don't have much more to go! Very beautiful indeed, and great stitching! This is lovely Nicole. Such a pretty sampler. The colors all laid out next to each other are gorgeous!